Mystery Photo No. 17 was sourced from RAN files. What happened to the sailor in the stretcher? 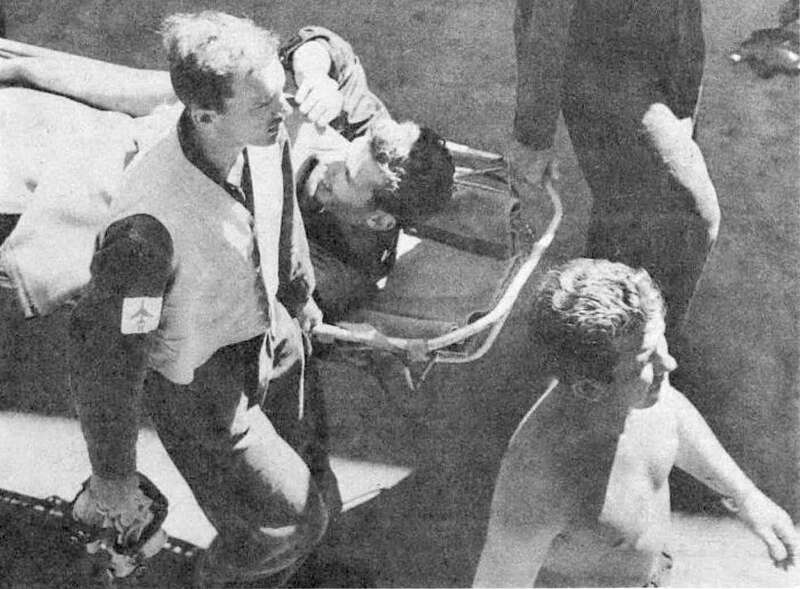 The sailor in the stretcher is Naval Airman (Aircraft Handler) Phillip MacNevin who had been plucked from the sea only a few minutes before the image was taken. 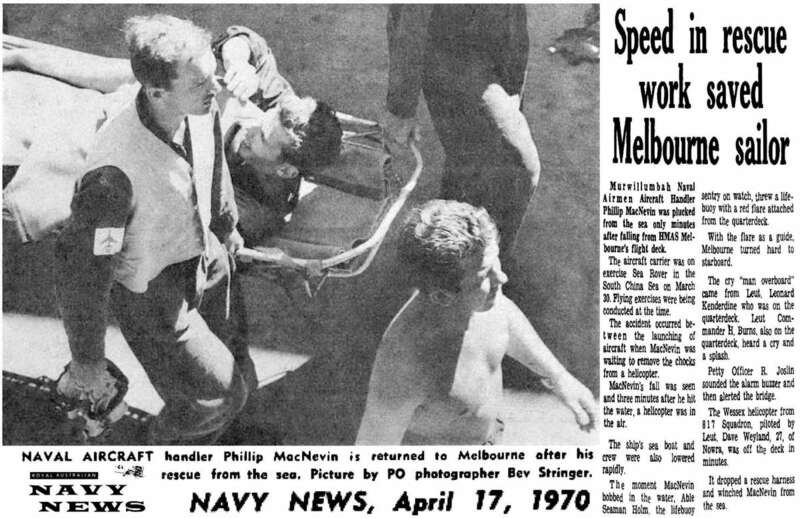 He had been standing near the edge of the Flight Deck of HMAS Melbourne when he fell overboard. His departure was witnessed by people on the Flight Deck as well as by LEUT Leonard Kenderdine who was on the quarterdeck. The alarm was immediately raised and a Wessex was launched to rescue him, unharmed. The Wessex was from 817 Squadron and piloted by LEUT Dave Weyland. The date was early 1970. The correct answer to this Mystery Photo was furnished by Mike (Nipper) Doyle who now resides in the ACT and Richard Kenderdine (the son of Len) from Bowral in the Southern Highlands. Mike Doyle reports that NAM MacNevin was working around six spot when a starter hose came adrift and he leaped out of the way, only to lose his balance and fall over the side. The pilot of the Wessex immediately launched, apparently with his engine panels still open, and effected a rescue before the ship’s boat reached him. MacNevin was unhurt and after a short spell in sick bay was returned to 4C starboard mess deck. The incident, with slight variation in detail, was reported in the Navy News of April 17, 1970 (article via Phil Thompson). Other Mystery Photos See previous Mystery Photos and their answers.